Growing up, I loved anime and manga. One of my favourite animators remains a favourite: Hayao Miyazaki. The films of Studio Ghibli are beautiful, whimsical and haunting. If you’ve never seen a Ghibli film, what are you waiting for? The TIFF Bell Lightbox will be showing his most popular films at Spirited Away: The Films of Studio Ghibli. 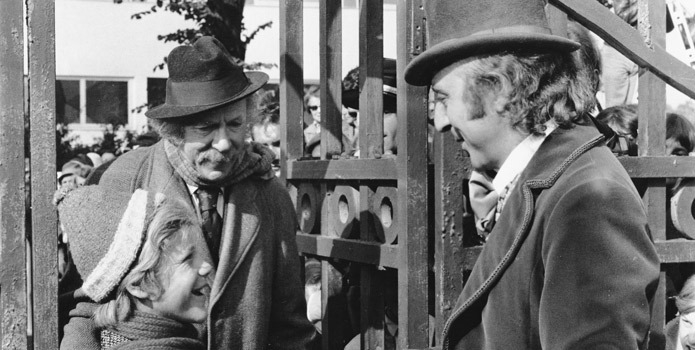 From December 24th to January 6th you’ll be able to catch his most famous films, as well as lesser known ones. If you don’t know where to start, My Neighbor Totoro is a great place to start, or my personal favourite, Howl’s Moving Castle! I’ve partnered with TIFF to give one lucky winner 2 tickets to see a Studio Ghibli film of their choice that’s playing before December 31st. 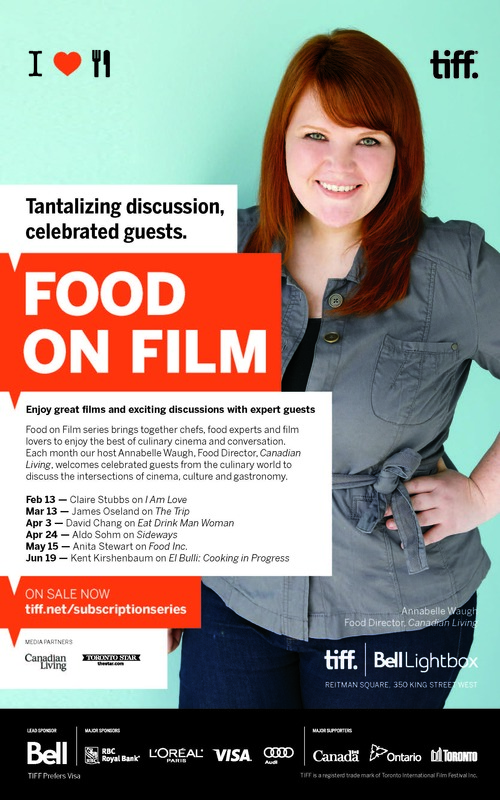 Food on Film is back at TIFF! This series marks the beginning of spring for me. The series kicks off with a film I really wanted to see at TIFF a couple of years ago, but was unable to: The Lunchbox. Check out the trailer. New this year, Whole Foods Market will sample food inspired by the film being screened. Awesome, right? For The Lunchbox, vegetable pakoras will be featured. The six-event series is hosted by Matt Galloway (Metro Morning) ​​features a​ lineup of ​internationally​-​known ​culinary experts who will discuss topical and timely food themes, following a screening of a film​ that is used as a springboard for the discussion​. Discussion topics will include food gleaning, processed grain health impacts, rise of urban gardens, green meal​-d​​delivery methods, ​and more. See below for the entire film series. Indian-born chefs, cookbook authors and restaurateurs Vikram Vij ​(Dragons’ Den) ​and Meeru Dhalwala present the award-winning festival hit The Lunchbox, exploring the art behind crafting Indian dishes and the popular rise of integrating homestyle cooking into restaurant cuisine. James Beard Award-winning travel writer and culinary anthropologist Naomi Duguid discusses the beloved documentary The Gleaners & I, and examines unique approaches to food gathering and agriculture — from the French countryside to Toronto’s organic urban gardens. Momofuku’s beverage director and Master Sommelier candidate Jordan Salcito presents the documentary Somm, sharing her expertise in wine curation and providing her personal insight into the hallowed halls of the competitive Court of Master Sommeliers. Wylie Dufresne, James Beard Award-winning chef and the leading American proponent of molecular gastronomy, introduces the post-apocalyptic comedyDelicatessen and discusses his playfully artful and boldly experimental approach to cooking. Chad Robertson, James Beard Award-winning baker and co-owner of San Francisco’s legendary Tartine Bakery, presents the intriguing new documentaryThe Grain Divide. He’ll delve into the topical gluten debate and discuss the health impact of over-processed grain consumption. California cuisine pioneer Jonathan Waxman pays tribute to Ivan Reitman (his partner in the Toronto restaurant Montecito) with a screening of the comedy kingpin’s classic Meatballs, and will discuss the art and business behind successful collaborations. Hurry, cause the 150 series subscribers receive a $50 gift card to Momofuku Toronto and a one-year print subscription to Toronto Life magazine. This spring at the TIFF Bell lightbox, Food on Film returns for its third year! This series brings together chefs, food experts and film lovers come together to enjoy the best of culinary cinema and conversation. Each month, series host Matt Galloway, of CBC’s Metro Morning, welcomes celebrated guests from the culinary world to discuss the intersections of cinema, culture and gastronomy. Guests and films include: food writer and editor of Lucky Peach magazine Peter Meehan on Wong Kar-wai’s Chungking Express (March 12); Madhur Jaffrey award-winning actress, author and authority on Indian cuisine, on David Kaplan’s Today’s Special (April 9); chef, founder and owner of Momofuku Milk Bar Christina Tosi on Mel Stuart’s Willy Wonka and the Chocolate Factory (May 7); award-winning mixologist Charlotte Voisey on Douglas Tirola’s documentary Hey Bartender (May 28); author and Toronto Star food columnist Corey Mintz on Louis Malle’s My Dinner with Andre (June 18); as well as inventor and co-founder of Booker and Dax Dave Arnold on Richard Fleischer’s Soylent Green (July 9). I’m looking forward to the culinary comedy Today’s Special. How about you? Spirited Away: The Films of Studio Ghibli returns from December 13 to January 3 to delight TIFF Bell Lightbox audiences with a near-exhaustive 18-film collection that includes a blend of new 35-mm and digital prints. TIFF is honoured to finally feature the rarely-screened masterpiece Grave of the Fireflies, one of Ghibli’s supreme accomplishments and regarded by many as the greatest animated film of all time. 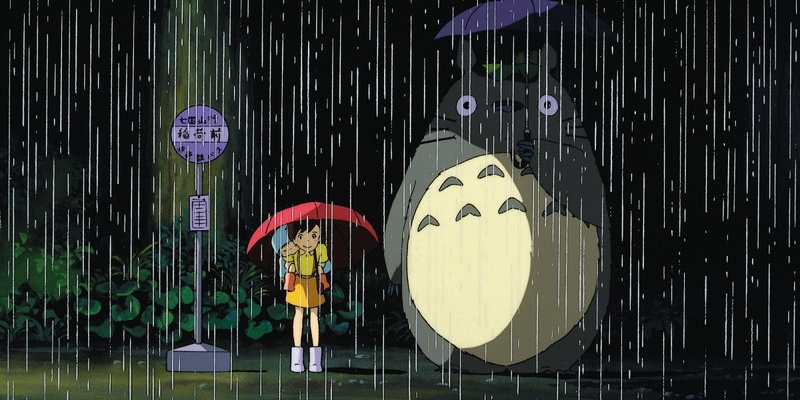 The lineup also includes From Up On Poppy Hill, a father-son collaboration between studio co-founder Miyazaki and his son Goro; beloved classics such as My Neighbor Totoro, Princess Mononoke and Kiki’s Delivery Service; rarely seen titles Only Yesterday and The Ocean Waves; and Hayao Miyazaki’s Academy Award®-winning Spirited Away. Audiences will have the chance to experience many of the films in two versions: in their original language with English subtitles, and star-studded dubbed versions voiced by high-profile talent including Cate Blanchett, Dakota Fanning, Matt Damon, Tina Fey, Anna Paquin, Kirsten Dunst, Billy Bob Thornton, Minnie Driver, Amy Poehler, Claire Danes and Liam Neeson. I am so excited for this! I love Studio Ghibli films. My favourite films are Kiki’s Delivery Service, Howl’s Moving Castle and My Neighbor Totoro. If you have never seen one of Studio Ghibli’s beautiful films, you are missing out! Take a look at the trailer below. Tickets are on sale now at TIFF Bell Lightbox. 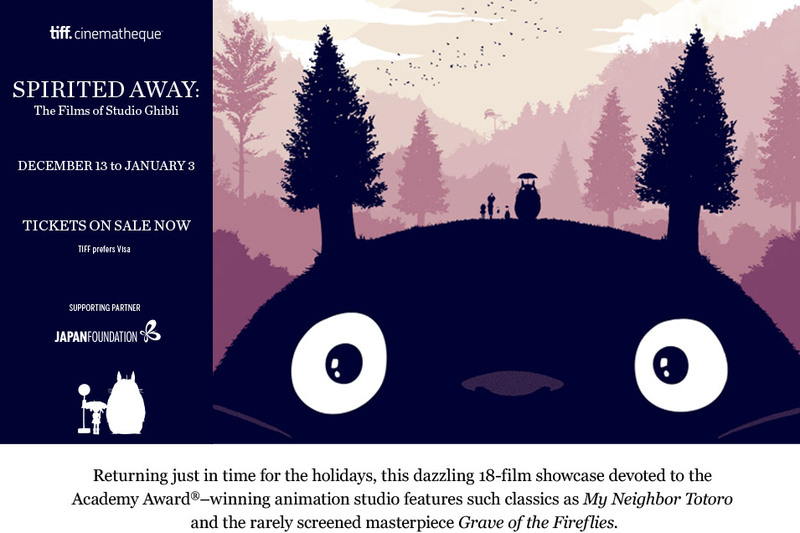 Visit http://tiff.net/ghibli to find out more. This month, TIFF Bell Lightbox kicks off it’s popular (and oft sold out) Food on Film subscription series. Loose yourself in 6 mouthwatering films and after each film discuss the intersections of cinema, culture and gastronomy with special guests. The event is hosted by Annabelle Waugh, Canadian Living Magazine’s Food Director. I recommend the film Sideways on Wednesday, April 24 with special speaker Aldo Sohm. Aldo Sohm, chef sommelier at La Bernardin, takes us into the world of wine appreciation through a discussion of Alexander Payne’s hit comedy-drama about a pair of middle-aged oenophiles who seek solace from romantic distress in the vineyards of California’s Napa Valley. Not into food? How about brain food? Books on Film also returns this month. A selection of films adapted from books will be screened and discussed afterwards with a selection of film makers, authors and experts. This series is hosted by Eleanor Wachtel from CBC’s Writers and Company. I recommend Midnight’s Children on Monday, June 24th with the filmmaker himself, Deepa Mehta! Celebrated Canadian filmmaker Deepa Mehta describes the process of collaborating with Salman Rushdie on the screen adaptation of his Booker Prize–winning classic Midnight’s Children. Go and subscribe to the series of your choice! It’s a nice way to get out and experience a night of film once a month!